Here is a copy of the draft National Commission for Higher Education and Research (NCHER) Bill 2010 . The bill is being hotly debated on several levels and current discourse looks more like power struggle rather than attempt for quality assurance. State governments are arguing that this is leading towards centralization of power and is taking away their autonomy of approving institutions through legislation and appointment of Vice-chancellors. Other debates are focusing on should professional field like medicine would be under the NCHER umbrella or not? There is also a discussion to delink the funding mechanism with the regulatory powers where NCHER will focus on regulation and there will be a separate body overseeing funding process for institutions. 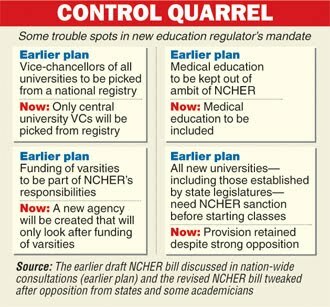 The primary purpose for NCHER bill is to ensure quality and accountability in higher education. However, in this power struggle, the purpose is getting lost. My most important critique of the bill is that it has not leveraged the power of transparency in bringing accountability and improving quality. For example, the bill states vaguely that the Commission would “monitor, through a national database, all matters concerning the development of emerging fields of knowledge, balanced growth of higher educational institutions in all spheres and academic quality in higher education and research” [24(ab)]. Although it does not clarify the form and function very well, one of the highlights of the bill should have been the establishment of a national database of institutional performance as compared to the whole section devoted to establishment of a database of VCs . Let us consider the case of regulation in financial system. How is transparency ensured in publicly traded companies? Apart from the regulator (SEBI) there is easy availability of audited financial reports of organizations. But there is no availability of parallel information of institutional performance in higher education. Further, the primary role of SEBI is to “…to protect the interests of investors in securities” while protecting the interests of students does not seems to be on the priority for NCHER. This is one of the most important functions NCHER should pursue i.e. to protect the interests of students by ensuring correct data reporting by institutions, aggregating it in a standard format and disseminating it to the public. For example, in the US, “The National Center for Education Statistics fulfills a Congressional mandate to collect, collate, analyze, and report complete statistics on the condition of American education; conduct and publish reports; and review and report on education activities internationally.” Currently, AICTE has the mandatory disclosure requirement however, it has serious limitations in terms of the kind of information collected and presented. It is very hard to compare several institutions in a easy to use format and hence students cannot use it for informed decision-making. Many other times, institutions continue to fudge information, hide these pages or other times do not update them. Imagine a scenario where, anyone can see all the approved institutions and their programs with their performance on various parameters of quality. When students start using this information for decision-making or regulators for funding decisions or policymakers for future policy directions, institutions will have no option other than working towards improving those metrics. To sum up, NCHER bill is a positive step in reforming higher education, however, it is limited by its political approach of using control as the way of ensuring quality rather than transparency. What are your thoughts? Share them through the comments link below. Next Is India ahead in “industrialization” of education?